2-Way ball valve with 32mm solvent sockets and ISO-Top (F05) and true union design. 25mm nominal diameter and max pressure 16 bar. Temperature range from -10 to 60°C. PVC housing with PVC ball, PE seat rings and EPDM O-rings. 2-Way ball valve of pvc from Tameson with 32mm solvent sockets on both ends. Thanks to the true union design, the valve can be easily installed or removed. The valve has a full bore (25 mm). The ball valve features an ISO 5211 flange and therefore it can be fitted with an electric or pneumatic actuator. The valve has no lever for manual control. The valve is on both sides equipped with solvent sockets (32mm). A pipe with an outer diameter of 32mm can be inserted into the socket with PVC glue. This is a double union ball valve (or true union). This means that the valve can easily be removed from the piping for inspection or replacement. The valve has a flange according to the ISO 5211 F05 norm. 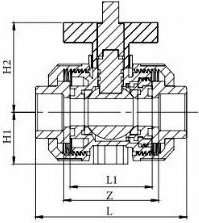 This makes the valve suitable for electric or pneumatic actuation. The valve is not equipped with a lever for manual control. This PVC valve with ISO 5211 top flange is meant for pneumatic or electric control and is suitable for various applications such as irrigation, aquariums, swimming pools, water supply, sanitary installations and drainage. The valve can be used up to a max pressure of 16 bar and a temperature between -10 and 60°C. PVC is resistant to a wide variety of chemicals, acids and bases and can be used for various media, including air, water, waste water and chlorinated water. The dimensions of the different valve sizes are given in the table below.